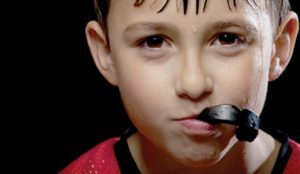 Mouthguards should be a standard part of your athletic uniform! Collision and contact sports are at a higher-risk for mouth injuries, but dental injuries can also happen in non-contact sports. Mouthguards usually only cover the upper teeth. Your bottom teeth are generally protected since they are further back. Your dentist can make a custom-made mouthguard that is comfortable and a perfect fit for you. Mouthguards can also work with braces and will help protect the cheek, gums, and lips along with the teeth.